Is your cat singing Judy Garland songs? Don’t let ‘em fool ya; it’s catnip, not gold at the end of the rainbow. This Yeowww! 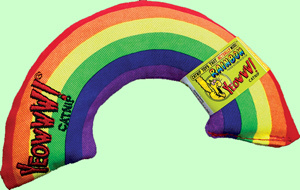 Rainbow is filled with 100% strong organic catnip and does not contain any stuffing. Measuring 6” it will brighten any cats day!